Warner Robins, Ga. – The Technical College System of Georgia (TCSG) named 2019 Exceptional Adult Georgian in Literacy Education (EAGLE) delegate from Central Georgia Technical College (CGTC), Virginia Scott, its Spirit and Social Media Award Winner for her enthusiasm amongst her fellow delegates during its recent adult education conference. 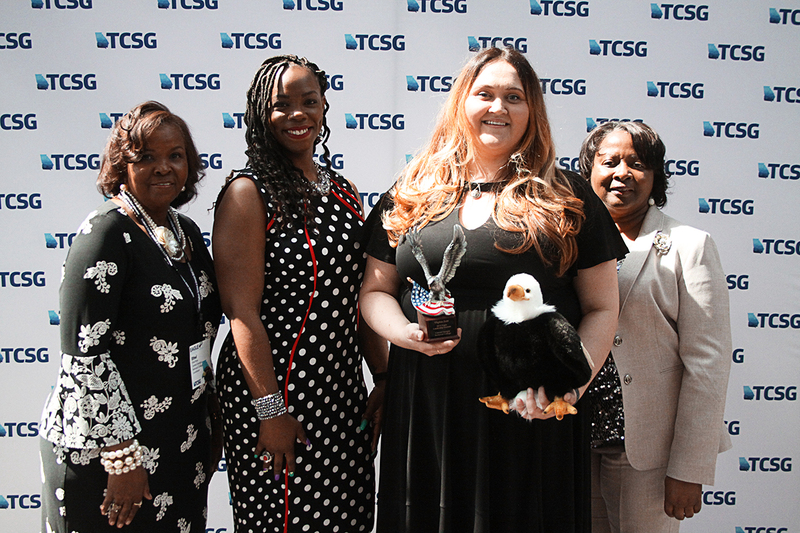 Scott, 32, earned her GED® from the College’s Adult Education Division in 2017, and represented CGTC as a delegate at the EAGLE Leadership Institute in Atlanta in March. Just four years ago, Scott was incarcerated, without custody of her children, and said she had deep thoughts of only ever being one of those “negative statistics”. Scott turned the negative into a positive, becoming one of 22 delegates from each of the TCSG Adult Education programs attending the Leadership Institute. The Institute recognizes and honors those students who have demonstrated superior achievement in adult education classes and programs. TCSG also named its overall EAGLE Winner to represent the adult education programs statewide for the next year. EAGLE is the first statewide program in the nation that recognizes and rewards excellence among students enrolled in adult education programs. This student recognition program is designed to create greater awareness of educational opportunities that are available in local communities across the state and to foster greater involvement in lifelong learning pursuits. TCSG, through its Office of Adult Education (OAE), sponsors the annual EAGLE Leadership Institute. Photo: The Adult Education Division’s 2019 EAGLE Delegate, Virginia Scott, stands center surrounded by (from left to right), instructors, Ethel Ross, and Lashan Cooper-Davis, and director of Operations, Dorothy Ferguson. This entry was posted in 2019 and tagged Adult Education, awards, GED, student success. Bookmark the permalink.